New archaeological structures – including what is believed to have been a monastery dining room – have been unearthed in the renewed excavations of a 13th century monastery in Tarnovgrad, the capital of the Second Bulgarian Empire (1185-1396 AD), in today’s northern Bulgarian city of Veliko Tarnovo. The medieval Bulgarian monastery in question, which was called Monastery of the Mother of God (Virgin Mary) was first discovered by Prof. Hitko Vatchev from the Veliko Tarnovo Regional Museum of History in the fall of 2014. 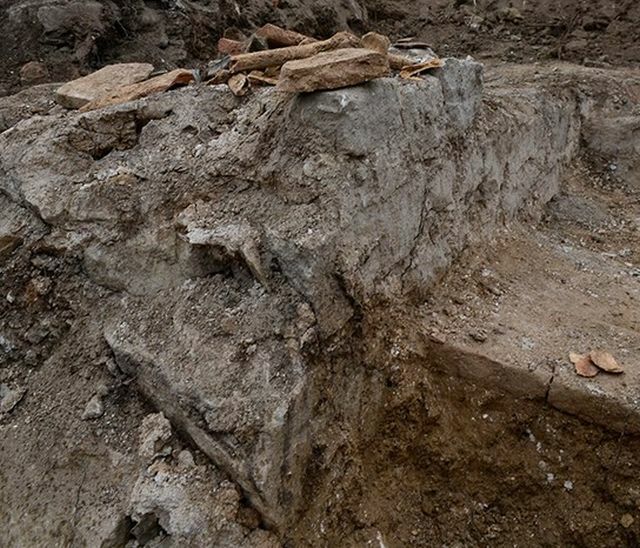 Vatchev has now continued his excavations of the medieval monastery, and has almost immediately unearthed previously unknown archaeological structures, reports the press service of Veliko Tarnovo Municipality. His team has discovered a building from the 13th-14th century AD with fragments of murals and ceramic decorations. Vatchev believes that was the monastery dining room based on the positioning of the surviving architecture. What is more, the deeper archaeological layers under the building have revealed the remains of another structure which dates back to the Late Antiquity and Early Byzantine period. 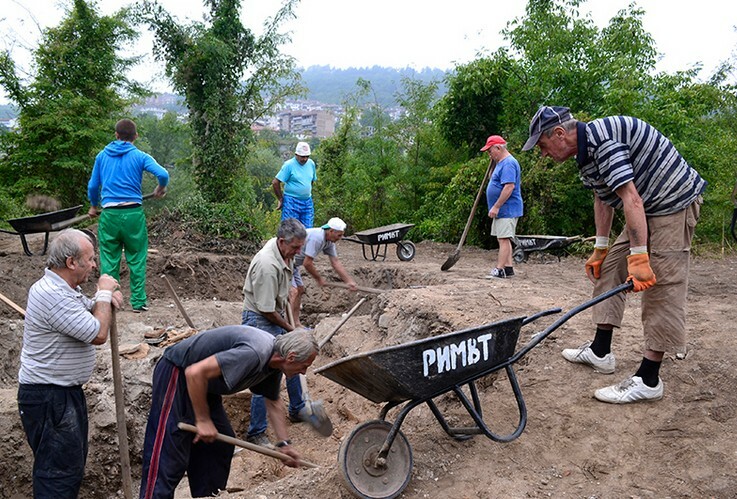 The renewed excavations of the 13th century Bulgarian monastery, which have progressed in spite of the rainy weather, have been inspected by Veliko Tarnovo Deputy Mayor Gancho Karabadzhakov. 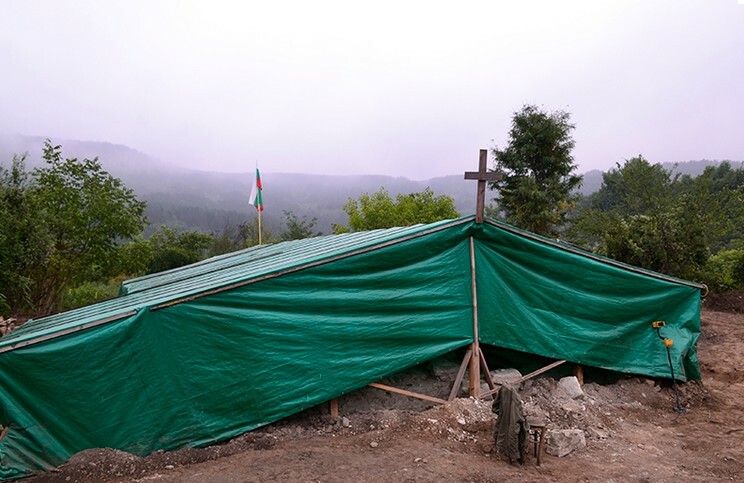 The 2015 excavations of the monastery have been funded with BGN 12,000 (app. EUR 6,100) by the Bulgarian Ministry of Culture, a small sum, to which Veliko Tarnovo Municipality has added another BGN 18,000 (app. EUR 9,200) from its own budget. The medieval Mother of God Monastery in Veliko Tarnovo was one of the major archaeological discoveries in Bulgaria in 2014. Its ruins are located to the southeast of the fortress wall of the Tsarevets Hill Fortress, in the so called Frenkhisar, or “Frankish Quarter", of the capital of the Second Bulgarian Empire Tarnovgrad. The Frankish Quarter is overlooked by the so called Baldwin’s Tower. It is named after Latin Emperor Baldwin I of Constantinople (Baldwin of Flanders), ruler of the Latin Empire of the Crusaders from the Third Crusade, who was kept and died there in captivity, after was taken prisoner by the Bulgarian Tsar Kaloyan (r. 1197-1207 AD) in the Battle of Adrianople. While it had long been believed that the Frankish Quarter’s name stemmed from the fact that during the High and Late Middle Ages it was populated by Western European merchants trading in the Bulgarian capital Tarnovgrad, in 2010 Veliko Tarnovo archaeologist Evgeni Dermendzhiev carried out excavations there and found no evidence of Western European presence. Instead, he discovered that in the High and Late Middle Ages the quarter was inhabited by Bulgarian craftsmen who specialized in metallurgy and especially in iron production. 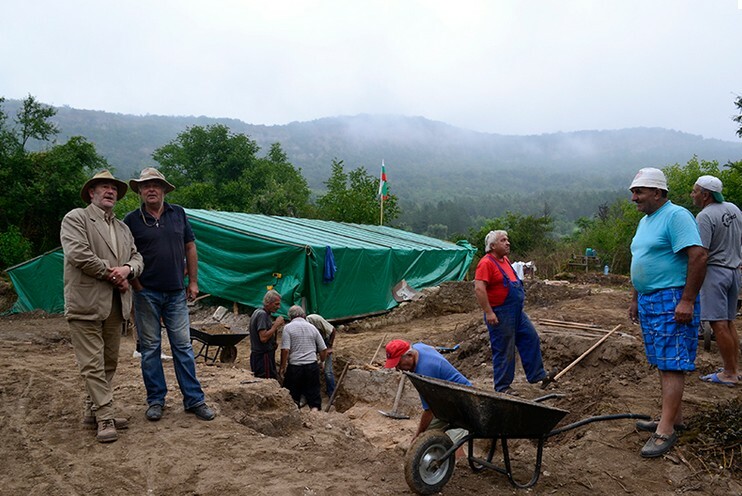 The 2015 summer excavations in Tarnovgrad’s Frankish Quarter by Prof. Hitko Vatchev will continue for about 40 days. Vatchev believes at the foot of the Tsarevets Hill under the Baldwin’s Tower his team might find the ruins of one of the following medieval Bulgarian monasteries – the Dormition of the Mother of God Monastery or the Holy Mother of God Hodegetria (meaning “She Who Shows the Way") Monastery. The Tsarevets Hill is one of two main fortified historic hills in the medieval city of Tarnovgrad, today’s Veliko Tarnovo, in Central Northern Bulgaria, the capital of the Second Bulgarian Empire between 1185 and 1396 AD. Together with the Trapesitsa Hill, Tsarevets was one of the two fortresses of the inner city acropolis of Tarnovgrad (Veliko Tarnovo). The Tsarevets Hill is a natural fortress on the left bank of the Yantra River, and is surrounded by it on all four sides with the exception of a small section to the southwest. It is located southeast of the Trapesitsa Hill. The Tsarevets Fortress had three gates, the main one being its southwestern gate. 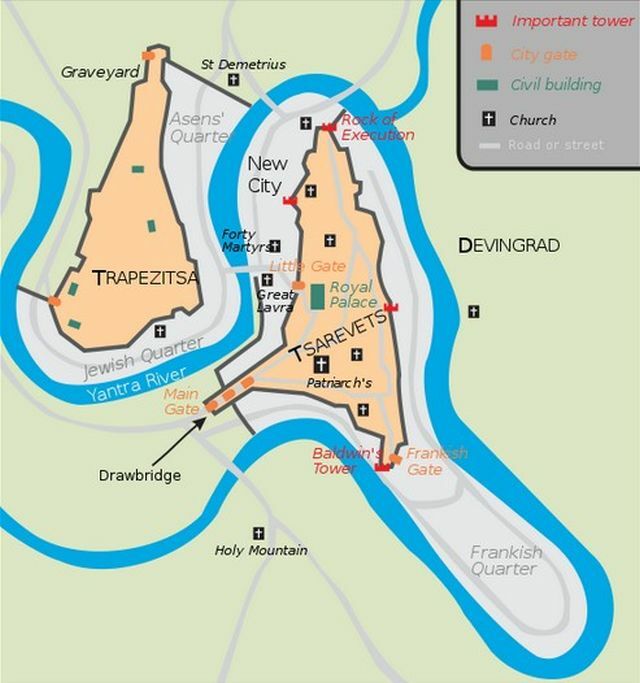 The name of Tsarevets stems from the word “tsar", i.e. emperor. The first settlement on the Tsarevets Hill in Bulgaria’s Veliko Tarnovo dates to the Late Chalcolithic (Aeneolithic, Copper Age), around 4,200 BC. The hill was also inhabited during the Bronze Age and Iron Age by the Ancient Thracians, and there have been hypothesis that it was the site of the legendary Ancient Thracian city Zikideva – even though a recent hypothesis claims that Zikideva was in fact located in the nearby fortress Rahovets. An Ancient Bulgar settlement was built on the Tsarevets Hill in the 9th century AD, during the First Bulgarian Empire (632/680-1018 AD) which later grew into a city. The Tsarevets Hill rose to prominence as the center of the Second Bulgarian Empire (1185-1396 AD) in 1187, after the successful Uprising of Asen and Petar, later Tsar Asen I (r. 1190-1195 AD) and Tsar Petar IV (r. 1185-1197), who ruled as co-emperors, against the Byzantine Empire in 1185-1186 AD. Thus, the construction of the Tsarevets Hill Fortress began in the 12th century AD. The total length of the Tsarevets Hill fortress wall is 1,1 km, and it reaches a height of 10 meters (on top of the natural defenses of the hill’s slopes) and a width of 2.4-3.6 meters. The most vulnerable point of the Tsarevets fortification was the southeast section with its gate; however, it was protected by the so called Baldwin’s Tower because it is known that after defeating the Crusader knights from the 3rd Crusade in the Battle of Adrianople in 1205 AD, the Bulgarian Tsar Kaloyan captured the Latin Emperor of Constantinople Baldwin of Flanders, and kept him captive in the tower for several months, until Baldwin’s death. The Baldwin’s Tower was restored in 1933 by Bulgarian archaeologist and architect Alexander Rashenov; the restored Baldwin’s Tower was modeled after the surviving fortress tower in another medieval Bulgarian city, the Cherven Fortress. The medieval church of the Bulgarian Patriarchate is located in the center of the Tsarevets Hill. It is called the Church of the Ascension of God, and was restored in 1981. The church was known as the “mother of all Bulgarian churches", and was part of a complex with a territory of 2,400 square meters. Right next to it are the ruins of the imperial palace of the monarchs from the Second Bulgarian Empire which had a territory of almost 3,000 square meters. Both the imperial palace and the Patriarchate’s complex were surrounded by fortress walls and protected by towers. The archaeological excavations on the Tsarevets Hill have revealed the foundations of a total of 470 residences which housed the high-ranking Bulgarian aristocracy, 23 churches and 4 urban monasteries as well as a medieval inn. In the northern-most point of the Tsarevets Hill there is a high cliff cape known as the Cliff of Executions which in the 12th-14th century AD was used for executing traitors by throwing them into the canyon of the Yantra River. For some 200 years the medieval Tarnovgrad, also known as Tsarevgrad Tarnov (i.e. the Tsar’s City), together with its fortresses Tsarevets, Trapesitsa, and Momina Krepost (“Maiden’s Fortress"), also known as Devingrad (“Virgins’ Town"), rivaled Constantinople as the most important city in this part of Europe, with some of the most glorious and famous Bulgarian Tsars – Tsar Asen (r. 1190-1195), Tsar Petar (r. 1185-1197), Tsar Kaloyan (r. 1197-1207), Tsar Ivan Asen II (r. 1218-1241), Tsar Konstantin Asen Tih (r. 1257-1277), Tsar Ivaylo (r. 1277-1280), Tsar Todor (Theodore) Svetoslav (r. 1300-1322), Tsar Ivan Alexander (r. 1331-1371), and Tsar Ivan Shishman (r. 1371-1395) – ruling their empire from Tsarevets. Tsarevets and the rest of Tarnovgrad had a tragic fate, however, after in 1393 AD, after a three-month siege, it became the first European capital to fall prey to the invading Ottoman Turks. This was somewhat of a logical outcome after the de facto feudal disintegration of the Second Bulgarian Empire in the second half of the 14th century. After Bulgarian Tsar Ivan Alexander (r. 1331-1371 AD) lost his two eldest sons – Ivan in 1349 AD and Mihail in 1355 AD – in battles with the Ottoman Turks, he failed to prevent a number of Bulgarian feudal lords from seceding, and on top of that divided the remainder of the Bulgarian Tsardom between his two surviving sons. His third son Ivan Sratsimir (r. 1371-1396) received the smaller so called Vidin Tsardom, with the Danube city of Bdin (Vidin) as its capital, and his fourth son Ivan Shishman (r. 1371-1395) received the rest, the so called Tarnovo Tsardom, with the capital proper of Tarnovgrad (today’s Veliko Tarnovo). Just two decades later all Bulgarian lands, disunited and even warring among themselves, fell prey to the invading Ottoman Turks, ushering Bulgaria into five centuries of Ottoman Yoke (1396-1878/1912), and signifying a practically irreversible loss of its former great power status. As the last ruler of Tarnovgrad, Tsar Ivan Shishman was not in the capital at the time it was besieged by the forces of Ottoman Sultan Bayezid I (r. 1389-1402 AD), its defense was led by the legendary Bulgarian Patriarch St. Euthymius (Evtimiy) of Tarnovo (ca. 1325-ca. 1402-1404 AD), the founder of the Tarnovo Literary School. After they conquered the Bulgarian capital on July 17, 1393, the Ottoman Turks slaughtered its population – an especially dramatic scene was the beheading of 110 captured Bulgarian aristocrats, and razed to the ground the Bulgarian imperial palace and the churches and monasteries of the Bulgarian Patriarchate. Tsarevets and Veliko Tarnovo were liberated from the Turks in the summer of 1877 in the Russian-Turkish War of 1877-1878 that restored the Bulgarian state. The archaeological restoration of the Tsarevets Hill Fortress began in 1930 and was completed in 1981, the year that was celebrated, now somewhat questionably, as the 1300th anniversary since the founding of the Bulgarian state. Tourists visiting Tsarevets can view the so called “Sound and Light" audiovisual show, an attraction using lasers and music to tell the story of the medieval Bulgarian Empire as well as Bulgaria’s fight for freedom against the Ottoman Empire, and the story of Bulgaria’s National Liberation. It was first launched in 1985 for the 800th anniversary since the Uprising of Asen and Petar. The Tsarevets Fortress was granted a protected status by the Bulgarian government for the first time in 1927, and in 1964 it was declared a “monument of culture of national importance". The Trapesitsa Hill is one of two main fortified historic hills in the medieval city of Tarnovgrad, today’s Veliko Tarnovo, in Central Northern Bulgaria, the capital of the Second Bulgarian Empire between 1185 and 1396 AD. Together with the Tsarevets Hill, Trapesitsa was one of the two fortresses of the inner city acropolis of Tarnovgrad (Veliko Tarnovo). The Trapesitsa Hill is a natural fortress on the right bank of the Yantra River, and is surrounded by it on three sides. It is located northwest of the Tsarevets Hill. The Trapesitsa Fortress had four gates, the main one being its southern gate, which was also connected with the Tsarevets Fortress with a bridge across the Yantra River. There are two hypotheses about Trapesitsa’s name. The first one is that it comes from the Bulgarian word “trapeza" meaning a “table" or “repast", possibly referring to the receptions of the medieval Bulgarian Tsars; the second hypothesis is that the word comes from “trapezium" because the hill is in fact is a trapezoidal plateau. The first archaeological excavations on the Trapesitsa Hill Fortress in Bulgaria’s Veliko Tarnovo between 1884 and 1900 revealed the foundations of 17 medieval Bulgarian churches with fragments of rich murals, colorful mosaics, and beautiful floor tiles. The documented artifacts discovered there include crosses, necklaces, coins, rings, earrings, vessels. The churches on Trapesitsa were richly decorated with various architectural forms such as pilasters, niches, blind arches, colored slabs, among others. The largest preserved church on the Trapesitsa Hill known as “Church No. 8" is named after the 10th century AD Bulgarian saint, St. Ivan Rilski (St. John of Rila) (876-946 AD); it was surrounded with other buildings which are believed to have been part of a monastery complex. It is known that in 1195 AD, Bulgaria’s Tsar Asen I (r. 1189-1196 AD) transported the relics of St. Ivan Rilski from the city of Sredets (today’s Sofia) to Tarnovgrad (today’s Veliko Tarnovo), and had them placed in the specially constructed church on the Trapesitsa Hill. The Bulgarian archaeologists believe that a room in the southern part of Church No. 8 was the reliquary for St. Ivan Rilski’s relics. The relics of St. Ivan Rilski (St. John of Rila), who is Bulgaria’s patron saint, were kept in Veliko Tarnovo until 1469 AD when they were transported to the Rila Monastery where they are kept to this day in what became a major event for the Bulgarians during the early period of the Ottoman Yoke (1396-1878/1912), as the Second Bulgarian Empire had been conquered by the invading Ottoman Turks in 1396 AD. The numerous and richly decorated small churches indicate that the Trapesitsa Hill harbored the homes of the medieval Bulgarian nobility, the boyars, and the supreme clergy. More recent excavations, however, also indicate that the imperial palace of the early Bulgarian Tsars from the House of Asen (the Asen Dynasty, r. 1185-1257 AD) was in fact located on the Trapesitsa Hill, and the imperial seat was possibly moved to the nearby Tsarevets Hill only later, during the reign of Tsar Ivan Asen II (r. 1218-1241 AD). 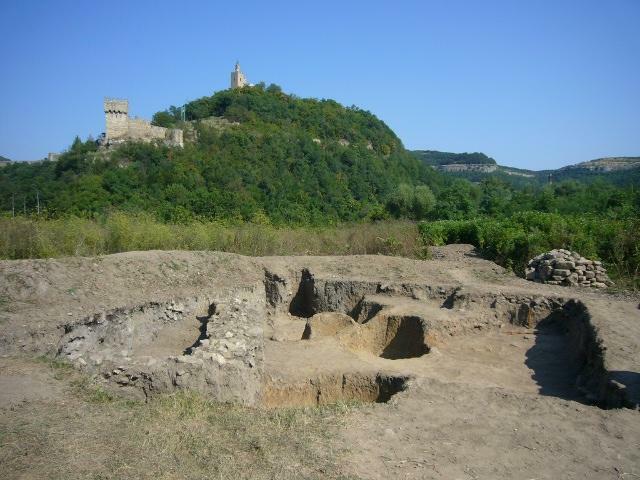 In the recent years, the Trapesitsa Hill has been excavated by Prof. Konstantin Totev from the Veliko Tarnovo Branch of the National Institute and Museum of Archaeology of the Bulgarian Academy of Sciences, and by Prof. Hitko Vatchev from the Veliko Tarnovo Regional Museum of History.